Synthetic phosphopeptide derived from the region of IR/IGF1R that contains tyrosines 1158, 1162 and 1163 of the human insulin receptor. The corresponding residues in the IGF1R are 1131, 1135 and 1136. CHO-T cells transfected with a vector encoding the human insulin receptor and stimulated with insulin, and 3T3-L1 adipocytes +/- insulin stimulation. The antiserum was produced against a chemically synthesized phosphopeptide derived from the region of IR/IGF1R that contains tyrosines 1158, 1162 and 1163 of the human insulin receptor (IR) as numbered according to Ebina, et al. (1146, 1150 and 1151 according to Ullrich, et al.). The corresponding residues in the IGF1R are 1131, 1135 and 1136. The sequence is conserved in human, mouse and rat for both the IR and IGF1R.The two relevant papers are:Ebina, Y., et al. (1985) The human insulin receptor cDNA: the structural basis for hormone-activated transmembrane signalling. Cell 40(4):747-758.Ullrich, A., et al. (1985) Human insulin receptor and its relationship to the tyrosine kinase family of oncogenes. Nature 313(6005):756-761. There are a long and a short isoform of this protein. This is why we are listing 1158, 1162 and 1163 in the name (where these phospho sites in the long isoform) as well as 1146, 1150 and 1151 (for the short isoform). The antibody has been negatively preadsorbed using a non-phosphopeptide corresponding to the site of phosphorylation to remove antibody that is reactive with non-phosphorylated Insulin Receptor (IR). The final product is generated by affinity chromatography using an IR-derived peptide phosphorylated at tyrosines 1158, 1162 and 1163 (1131, 1135 and 1136 for IGF1R). Our Abpromise guarantee covers the use of ab5681 in the following tested applications. WB 1/1000. Detects a band of approximately 100 kDa. Peptide Competition: Extracts prepared from CHO-T cells transfected with an insulin receptor containing vector and left unstimulated (1) or stimulated with insulin (2-8) were resolved by SDS-PAGE on a 10% polyacrylamide gel and transferred to PVDF. Membranes were blocked with a 5% BSA TBST buffer overnight at 4°C and incubated with the ab5681 antibody for two hours at room temperature in a 3% BSA-TBST buffer, following prior incubation with: no peptide (1, 2), the non-phosphorylated peptide corresponding to the immunogen (3), a generic phosphotyrosine-containing peptide (4), the phosphopeptides corresponding to other IR/IGF1R sites (5-7) or, the phosphopeptide immunogen (8). 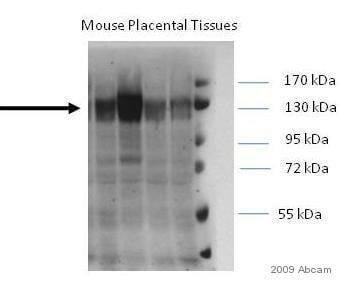 After washing, membranes were incubated with goat F(ab’ 2 anti-rabbit IgG HRP conjugate and bands were detected using the Pierce SuperSignal method. 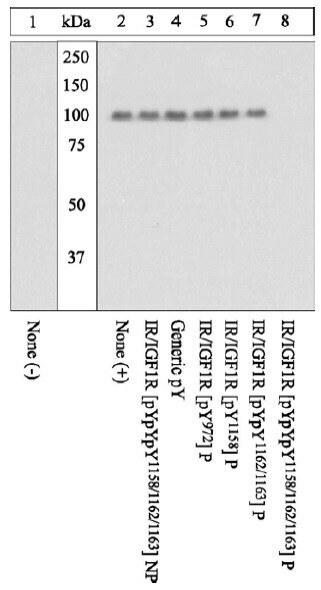 The data show that only the phosphopeptide corresponding to IR/IGF1R [pYpYpY1158/1162/1163] completely blocks the antibody signal, thereby demonstrating the specificity of the antibody. The data also show the activation of the insulin receptor upon stimulation with insulin. Publishing research using ab5681? Please let us know so that we can cite the reference in this datasheet. e I am interested in phospho sites Y1162, Y1163 of the insulin receptor I wonder if you offer such an antibody? Is the ab5681 anti IGF1receptor Y1158, Y1162, Y1163 specific for the IGF1 or does that antibody also recognize the phosphorylated insulin receptor at site Y1162 and Y1163? Wenn Sie einen Antikörper suchen ,der nur mit dem IGF1 Rezeptor reagiert , wenn dieser an Y1158 + Y1162 + Y1163 phosphoryliert ist, ist dies der Richtige für Sie. Er reagiert nicht mit dem unmodifizierten Protein, und laut unserem Datenblatt reagiert der Antikörper nur mit dem Protein, wenn es eben an allen drei Phosphorylierungsstellen modifiziert ist. Testing dicount for ab5681to use in rat tissue. I am very pleased to hear you would like to accept our offer and test ab5681 inrat tissue. This code will give you 1 free PRIMARY ANTIBODY before the expiration date. To redeem this offer, please submit an Abreview for rat tissue and include this code in the “Additional Comments” section so we know the Abreview is for this promotion. For more information on how to submit an Abreview, please visit the site: www.abcam.com/Abreviews. i'm interested in detecting insulin receptor activation and have been looking at the literature. It is stablished that autophosphorylation of InsR,to undergo activation, takes place at tyr 1146, tyr 1150 and tyr1151. My question is ,why this phosphospecific Ab recognize phorylation at site 1158, 1162 and 1163? is it because the sequence is in different species? arr those sites known to be phosphorylated aswell, when binding of insulin to the receptor? thanks in advance for your time.